I had originally planned to do this last year- BUt the backend management of the website was not going as planned.... So, solutions had to be found and improvements made! Some of the changes coming ( and almost done- we're down to image selection now) are faster loading pages, galleries that are more interactive and selective, and the BIGGIE for 2008- shopping cart for fine art onlineprint sales! and he is looking back on some of the interviews he's had in the past year. Yep, I'm in there again- but I encourage you to go and take a look at how cool everyone else's answer was to the question "What would be your most important piece of advice about life?" Some of his favorite answers to the select questions are being highlighted on his blog. What advice do you have for a novice creative professional/photographer? I strongly recommend you check out all of the comments- there are many better than mine that will guide you in your quest for true photographic nirvana! I was checking out a blog topic on strobist called "our photos, Ourselves" about a movie that featured Nick Nolte as a photojournalist. The point being made was being able to detach yourself from your photography to make objective decisions on whether an image you make is good or bad. There was a comment made back about movies - as it became a little off topic- The question arose ( inspired from the Twilight Zone marathon) "If you were the last person on earth, would you still take photographs even tho no one else would see them?" I thought about it- and I have to say yes; yes I would! I would still feel a need to make photographs that meant something to me personally. I wouldn't think that a writer would stop writing, or a sculpture would stop sculpting- granted the subject matter may change-but the essence of that person would still need to be expressed. 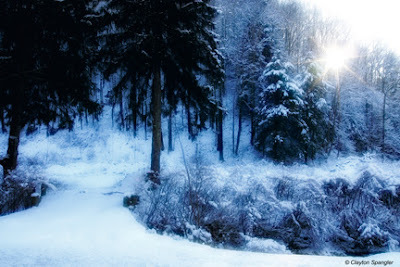 Since the snow didn't start falling til last night , here is an image from my "Glimpse Of Appalachia" exhibit. For those of you in warmer climates; Winter has it's own beauty- there is a "clean-ness" to the look as snow covers the land , hiding away those things that take away. Hope everybody had a good new years- Welcome back to the grind!